In order to play with the big boys in Buffalo, Belarus is going to need to muster as much firepower as possible. 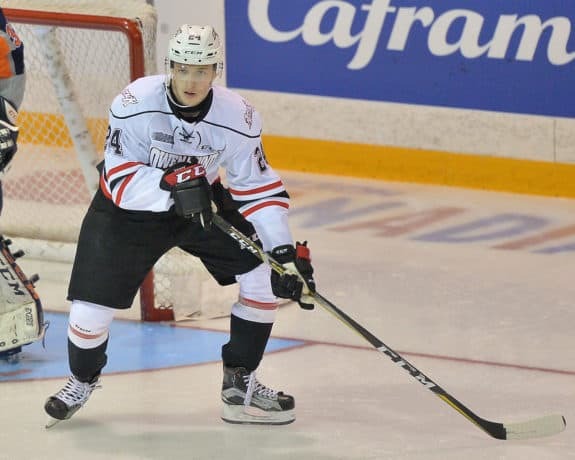 OHL standout Maksim Sushko will need to carry a sizable chunk of the load, but is he up to the task? Any Philadelphia Flyers’ fans who intend to watch the tournament on TV or attend in person should keep close tabs on Sushko. After all, he was the Flyers’ fourth-round pick over the summer. A solid showing in Buffalo by Sushko could open a window for his career in Philly. The main core of Philadelphia forwards are all around the age of 30, give or take a year. Claude Giroux, Wayne Simmonds, Jakub Voracek, Valtteri Filppula, and Dale Weise are all within that ballpark. Though there may be no need for true worry, Philadelphia needs to at least be aware (and prepared accordingly) given the ages of their players. Depending on what Sushko can do for Belarus in less than a week’s time, he may have the Flyers organization resting a little easier at night. First and foremost though, Sushko will need to get the job done for the Belorussians. While it is highly unlikely that Belarus has any shot for a medal, they will do their darndest to stave off elimination. You have to keep in mind that Sushko is part of the reason that Belarus is even in Buffalo in the first place. During the 2017 Division 1-A World Juniors, he and Belarus suffered only a single OT loss in their five tournament games. Edging out the host nation Germany by two points in the standings, Belarus found themselves at the top of the win column and with a gold medal in hand. With that performance, they vaulted themselves into the top division tournament, and that is why they are here. Sushko, to his credit, appeared in all five games for Belarus at that 2017 tournament. He scored a single tally which came against France in their first of the five games. Sushko would finish the tournament as a plus player for Belarus. 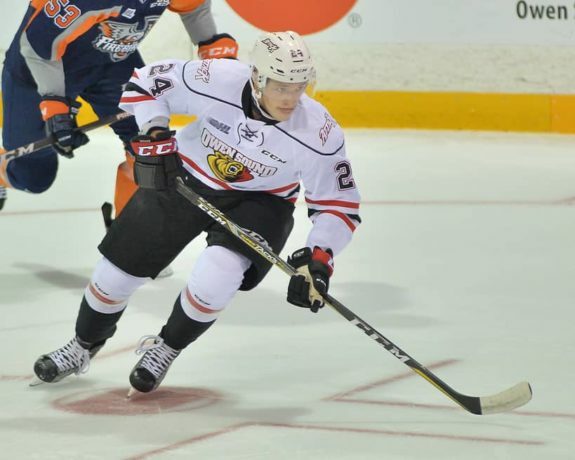 In each of his two years with the OHL’s Owen Sound Attack, Sushko has just gotten better and better. He played in 54 games during the 2016-17 season, when he registered 17 goals and 15 assists. He would also be a plus-10 on the season. Where Sushko truly excelled last season, though was in the OHL playoffs. The Attack lost in the conference finals to the Erie Otters, but Sushko, however, was still one of the team’s top playoff performers. In their 17 playoff games, he scored three goals and eight assists. His plus-five was also tied for third-best on the team for playoff pluses and minuses. Here, in 2017-18, he has produced even more, at nearly a point-per-game pace. In 28 contests, Sushko has 16 goals and 10 assists. He also has not shied away from any rough stuff, either. Those 32 penalty minutes of his speak true to that. At 6-foot and 185 pounds, he is a decent-sized player. Not immense, but certainly decent. Sushko is also known for being relentless in puck pursuit. His upswing of generating offense makes up for any lack of focus on defense. Sushko responds like a dog spotting a rabbit when he sees an opportunity to steal a puck. We need to go more in-depth though with Sushko’s performance in Owen Sound this year. The information that can be derived from it further exemplifies his importance for Belarus. Of the 16 goals he has scored this year, three have come on the power play and two are shorthanded. This speaks to Sushko’s all-around game, even though responsibility in his own zone is not usually considered a forte of his. Separately, he has scored those 16 goals on only 70 shots. To be firing at well over 20% accuracy is what Belarus is going to need from him in Buffalo if they are to avoid relegation. This is the type of production they will need in order to even be relevant. 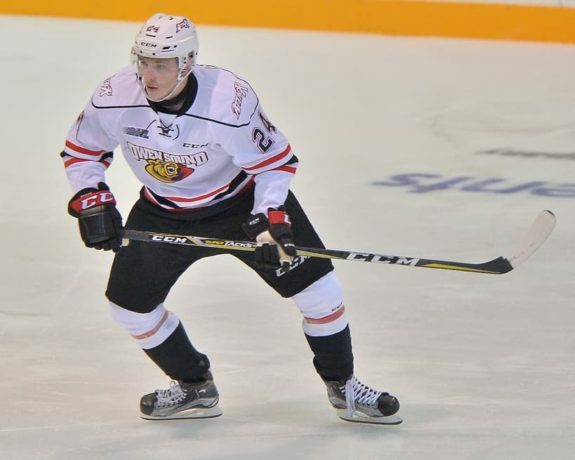 Sushko’s finest outpouring this OHL season came on Oct. 14th against the Oshawa Generals. The Attack crushed the Generals by a score of 12-6. Sushko put seven shots on goal during the game. Four of them ended up in the back of the net. In meaning no disrespect, it is, in fact, an understatement to say that Belarus has their work cut out for them. Placed in Group B with Sweden, Russia, Switzerland and the Czech Republic, they will need to play a tight, defensive game. Even with a player like Sushko pumping on all cylinders, Belarus does not have the overall depth to compete with the other teams. This is particularly the case when it comes to skill and speed. Belarus needs to play in a more defensive system to keep the games close. Then, on top of that, they will need Sushko and counterparts to get a goal every chance they can get. If they cannot keep the scores low and put at least two pucks in each game, Belarus will have no shot. The whole intent of Belarus ought to be avoiding relegation at all costs. They will have a year under their belt and a chance to build upon any success for next year. If they can escape relegation. For that to happen, Maksim Sushko will need to produce, alone if necessary. What Belarus needs to do additionally is have modest benchmarks leading up to their goal of staying out of relegation. To do that, they must determine what advantages they can gain over comparable teams. On paper, the closest comparisons to Belarus would be Denmark, Slovakia, and Switzerland. Each of these three teams are in a similar boat to Belarus in terms of their skill sets as well. Sushko and company will need to do their best to determine the opposing teams’ weaknesses, and then execute a means of exploiting them. Housed in the same group as Switzerland, they may have to start there. While Sushko had a lone goal at the 2017 Division 1-A, that will not fly in Buffalo. For Belarus to get the jump on those aforementioned weaknesses, this young man needs to be at least a point per game player.